Dallying In The Dirt, Issue #329 - I have had great success dividing Colchicum. Here’s a long thin picture that tells a story of gardening success. When I was renovating the big perennial gardens last fall I decided to dig up a large clump of Colchicum, after they had finished blooming and divide them. I put a few of them in each of several spots along the new narrow bed along the fence. To my great delight they not only survived they flourished and are putting on a great show between the clumps of Panicum virgatum“Heavy Metal”. That delightful grass was also dug up and divided last autumn and thrived in its new location. I have a couple of other large clumps of Colchicum that I may dig and divide this year. They are quite expensive bulbs and this is a great way to spread their burst of fall colour. Beside the house under the shade of the big Walnut I have a space that we call summer camp. That’s where several of our part time houseplants spend the summer months. Most of the Orchids spend the summer there and they often respond as this Phalaenopsis has. 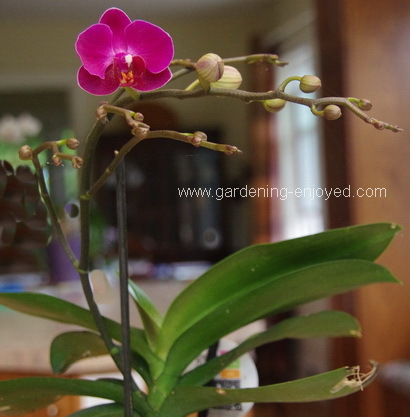 It has thrown 2 flower stalks with many buds on each and as soon as the first flower opened last week it found its way into the kitchen where we will enjoy those blooms for a few months. I inspect it very carefully for any sign of scale and physically remove any that I find. Orchids that go outside in the spring with a bit of scale seem to lose it over the summer. Scale insects have enemies and predators other than me and they tend to help us out over the summer. The Cymbidium Orchids summer on the other side of the house where they appreciate the extra sunlight. They will wait outside for a week or three yet until they have had some cooler nights. 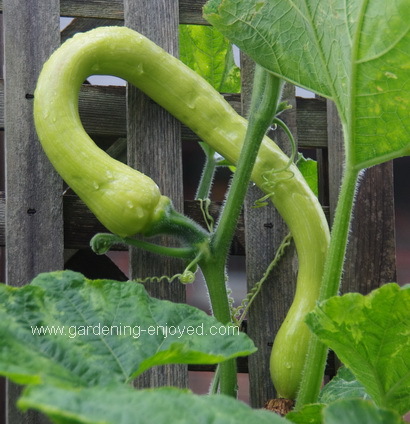 I have been showing the amazing growth and large fruit from my climbing Zucchini and while it is quite interesting, I do grow it to get some edible Zucchini. This one is about 40 cm long and maybe 2.5 cm (1") in diameter. The flower has just faded and it was soft and delicious in a stir fry last night. I have to be rather observant and quick with these fruit or they will turn into monsters seemingly overnight. If I see them at the correct size to pick then I pick them because when I go back a few days later they will be much larger and starting to get a bit tougher fleshed. 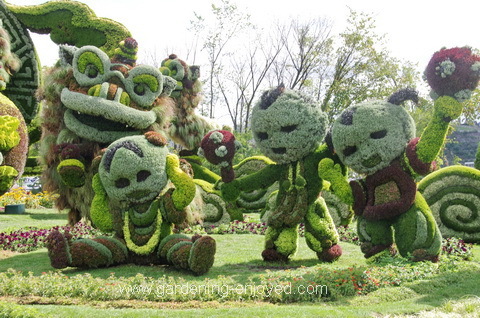 I have to mention Mosaiculture again. You have just over a week before it closes and it probably won’t be back for several years. This picture of the dancing bears was part of a much larger sculpture with dragons and other exotic beasts. It was one of the favourites of my 10 year old photographer and it gave me the opportunity to show him how to get a better picture even when he had to face directly into the sun to get it. I could go on showing you pictures of this amazing horticultural display for the next year but once it closes that would only be teasing you. It certainly deserved a second mention this week. 5.5 million little plants were used to create all of those wonderful sculptures. Why is Mother Nature sometimes so difficult. Today is the 4th day in a row that it has been raining enough to keep me from the garden. On the other hand I’m sure it’s wonderful for my daughter’s newly sown grass seed. Cool days and adequate moisture are just what is needed to get that seed up and growing. Carol Asks? My friend dug up his four o'clock tuber and it is huge about 10 to 12 inches around. He would like to know if it is safe to cut that ? Ken Answers! I have no personal experience with four o clocks but my research indicates that the tubers can be readily divided and replanted. Maybe some of our readers can provide first hand experience. Margaret Asks? Any suggestions re extending the growing season using Kozy Coats as sold by Lee Valley. I have put them around a red pepper, eggplant and mouse melon , all in containers, in the hope of a better harvest. Ken Answers! Never tried anything like that. I'm usually happy to just pick what's left and look forward to something different as my fall crops of Pak Choi and Broccoli and other cool season veg mature. My friend Niki Jabbour has a year round vegetable garden in Nova Scotia and you can read about her techniques here.